Applicable2U is excited to be apart of a wonderful project. AppStar Picks is a collection of over 250 top picks apps for kids reviewed and tested by well-established independent review sites. It offers a large selection of curated apps for kids of all ages – from toddlers to teenagers. AppStar Picks is specifically designed to allow parents, grandparents, teachers and carers to easily find the best apps for kids available via a friendly interface and an amazing smart search engine. It is universal and works on iPad, iPhone and iPod Touch. Click the image above and download it for FREE!! How many readers out there drink Snapple to quench their thirst, but also drink it because you feel as though you gain random knowledge under the cap? If you answered yes, then why not save the calories and drink water. With a simple download from the iTunes App Store to your Apple device, those random facts can still be acquired for a one time introductory price of $1.99. Recently launched at the beginning of this month, A Fact Everyday – 365 Fun Facts for Kids by Wombiapps can cause you and your child(ren) to begin wondering. Designed for your mobile device running iOS 4.3 or later, fact enthusiasts will gain knowledge on animals, people and the world around us. Through the use of clever illustrations, professionally recorded narration and a simple layout, the app name shouldn’t just say for kids, but for everyone. A Fact Everyday can be viewed in three languages: English, Swedish and Danish. Make it apart of your daily routine to turn on your mobile device not to check email or to surf the internet, but to learn a new and random fact each day. Visits can be done daily, or can be done as if going back in time. With a simple tap of the screen, a user friendly drop down menu will appear. This menu will provide young and old learners with access to several icons: a heart, date/calendar, star and a bookmark. As facts are visited, those that you “want to share with others” can be tagged by a heart. Sharing of a particular fact(s) can be done through an email or via Facebook. If a fact really makes an impact and needs revisiting, then click the “star”. All facts that have been starred will be placed in a hanging bookmark and can be viewed anytime or as the year draws to an end. On February 7th, the day we were introduced to this fun filled app, we learned that “the world’s smallest frog can fit inside a thimble.” How many people can say they knew that? Does it get you wondering more about this small creature? As a teacher, as I was reviewing this application, I was constantly coming back to the question, “How can these daily and random facts extend one step further as I teach my students to develop their 21st century skills? Immediately, a web resource called Wonderopolis came to mind. As the educational app, A Fact Everyday – 365 Fun Facts for Kids looks to spark curiosity and to bring out the inquisitive side of a child, Wonderopolis’ goal is is quite the same. Wonderopolis states on their About page, that it is “a place where wonder and learning are nurtured through the power of discovery, creativity and imagination.” How fitting that as facts are shared daily via your mobile device, that it can then be possibly further explored, if so desired, with an online free resource. What connections to the curriculum might this random fact have? If a connection can be made, Wonderopolis might have supplemental content, videos, vocabulary or lesson plan ideas to support that fact. The possibilities are endless! As you would rip off a page from a desk calendar, or turn wooden numbered blocks, this fact calendar will spark something new in your family or classroom. Regardless of how you choose to use A Fact Everyday – 365 Fun Facts for Kids, learning is happening. You may not be collecting points, unlocking new levels or obtaining rewards in a “gaming” like format to reinforce skills, but you are left to wonder what will come next or to ask the beloved question of why! If you would like to learn more about Wombi Productions, please click here to visit their website. To lock in on the introductory price of $1.99 for A Fact Everyday – 365 Fun Facts for Kids then click here to access it from your iTunes library before it returns to its normal price of $2.99. As the instructional technology specialist for my building, grades 3-5, I am constantly questioning myself and those that I collaborate with. A common question that I find myself asking, “is the approach or unit/lesson “true” technology integration which will meet a variety of curriculum standards?” Good integration can occur in a variety of ways, the latest being the impact that the mobile market has on education. Through our PLN (professional learning network) via Twitter, Murky Reef Lite by developers Frolyc came highly recommended and Applicable2U needed to know if in fact it was applicable to you. Designed for those with an iPad device running iOS 4.3 or later, downloaders (parents/educators) and aquatic learners will find this cross-curricular app very engaging as it enhances ones thinking skills and implements a variety of 21st century skills. Without even realizing it, this educational app has seamlessly incorporated a multitude of age appropriate skills and academic areas into one. Frolyc is a proud member of Moms with Apps, a collaborative group of family-friendly developers. As stated on their website, Frolyc aimes to create apps that will put users to the test as they learn through questioning, exploring and yes, even frolicking in unusual places. Murky Reef was built with Bloom’s Taxonomy in mind, which means as your child or students use this application, they will be building their knowledge of the ocean, supported for comprehension, encouraged to analyze and to apply their knowledge through a number of activities. We were very impressed with their informative website and the process that was put in place when creating Murky Reef – both versions: lite and the in-app upgrade for $3.99. With so many states moving towards a new set of standards, the Common Core Standards, educators will be pleased to see that their children’s “gaming” will in fact meet some of the math and language arts standards for children ages 4-10. Put your scuba gear on as your elementary student will be introduced to a various sea life creatures in the imaginary waters of Murky Reef. Through the use of very clear and concise tutorials, pictorial supports, pleasurable characters, animation and sound effects, ones curiosity will be sparked. Unlike most “lite” versions, Murky Reef does in fact provide users with a good amount of content. The lite version will give users access to 6 cross curricular areas: Number Sense, Spot Rhyming Words, Greater Than, “Not In” Letter, Addition 1-10 and a comprehension quiz. However, in the full upgrade, users will be given a total of 22 games as it builds on vocabulary, sight words, word synthesis, number patterns and sentence structure/composition to name just a few. 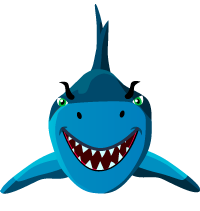 Regardless of which version is downloaded to your mobile device, along with interactive graphics and audio, users will also have access to informative text and safe videos as they explore such science topics as: the coral reef ecosystem, habitat and prey/predator relationships, and an introduction to sharks, pufferfish, cleaner fish and many more. While scouring the murky seas, your objective is to stop Ogee, the unfriendly Shark. With each level completed, players will earn fish rewards that can be manipulated in “creature play” mode. With 18 different sea creatures to collect, their fish tank will be filled with the schools of fish that they have saved. To learn more about those schools saved, drag them over your submarine and a pop up textbox will appear. A note to the developers – since this is an educational app for children as young as 4, might it be possible to include a reading option of this informational text if the application is being used independently. As the “Attack” and “Creature” modes are designed for the players, developers have also included a little something for parents and/or educators. With a simple tap of our four-eyed turtle friend in the lower right hand corner, parents and educators will have access to a very detailed report of how a user is doing. Reports will share the number of attempts made in each “Attack” mode and the percentage of correct answers. In addition, it will provide a break down of skills based on: comprehension, logical reasoning, language arts and math. Another suggestion for a future update might be to put a lock mode on our turtle friend as this information is most important to the parents and/or educator as it can guide them for future instruction and support. Applicable2U was very impressed with our Twitter find and would definitely give it a five star rating. Making cross curricular connections in multiple platforms and educational environments is critical. Those questioning whether to implement a 1:1 iPad pilot program or even to purchase for personal home usage need to see the educational connections that developers like Frolyc are making. If you would like to learn more about Frolyc, please visit their website here. To begin exploring Murky Reef Lite, simply click here to access via your iTunes library. However, if interested in the full version, simply click here.